SendGrid is an incredibly powerful “Email Infrastructure in the Cloud” platform. 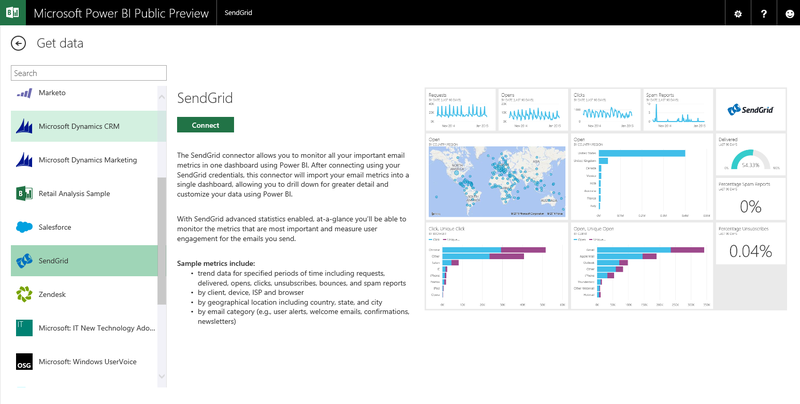 If you use SendGrid as a means for reaching your customers via email, then it is very easy to use Power BI as a means of monitoring and analyzing your email deliverability statistics. 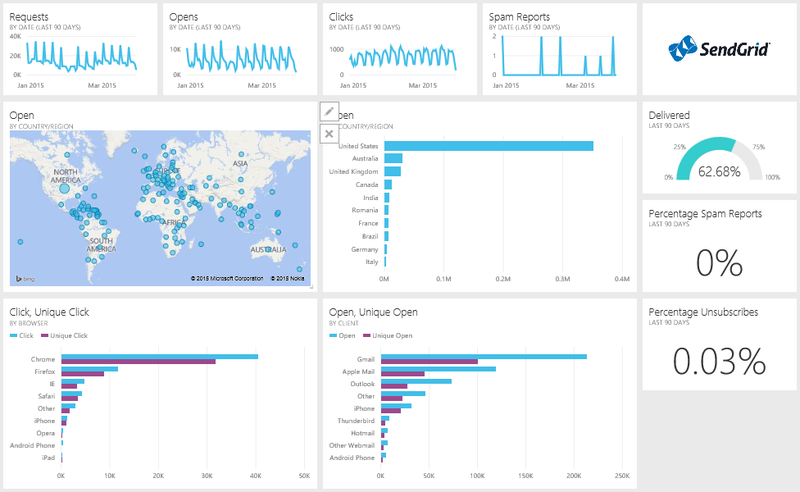 Power BI provides an instant, out of the box dashboard over your SendGrid data. 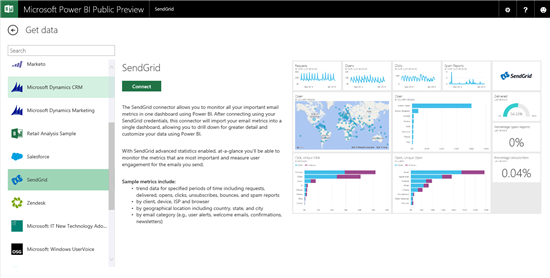 Using Power BI, you can analyze your SendGrid data in minutes. This blog post shows you how to connect to your SendGrid data and explore your email deliverability in depth. The dashboard you can create over your SendGrid account looks like the one below. The dashboard is fully customizable so you can tailor it to your needs. You can also combine data from this dashboard with data from other sources to create a single unified view of all the data you need to get your job done. This dashboard lets you track overall trends for your Requests, Email Opens, Email Clicks, Spam Reports, etc. You get a quick glance at your overall Delivery Rate (%) as well as stats such as Spam Report Rate (%) and Unsubscribe Rate (%). Also included, you will find Browser and Device based stats for Click/Open rates. You will also find Click/Open rates by Geography. One of our favorite features in the SendGrid dashboard is the ability to view stats by category—more on this in a bit when we talk about categories. While the dashboard view contains most of the key statistics you would want to glance at, there are a whole lot of insights that sit right beneath the dashboard that are accessible for you via interactive exploration. Clicking on a tile on the dashboard makes it possible to look at a drill down view of the data. When you are in the exploration view, you can switch between the pages of your report. Clicking the page number shown at the bottom of the report will open the page navigator that will help you switch to a different report page. Connecting to your SendGrid account is easy. All you need is your SendGrid username and password. You just need to make sure that your SendGrid account is configured for API access; Power BI simply uses the SendGrid API to import statistics into your Power BI account. The following steps assume that you already have a Power BI account. If not, create one by going to http://www.powerbi.com. Once you are logged into Power BI, click on the Get Data link in the top left corner. This will take you to the gallery of content packs that are available for you to consume. Each of these content packs will help you import your data into Power BI, from the various sources listed. Clicking on SendGrid will show you details of the SendGrid content pack. When you click on Connect, you will be prompted to enter you credentials. Once you enter your credentials, the data import process will begin. 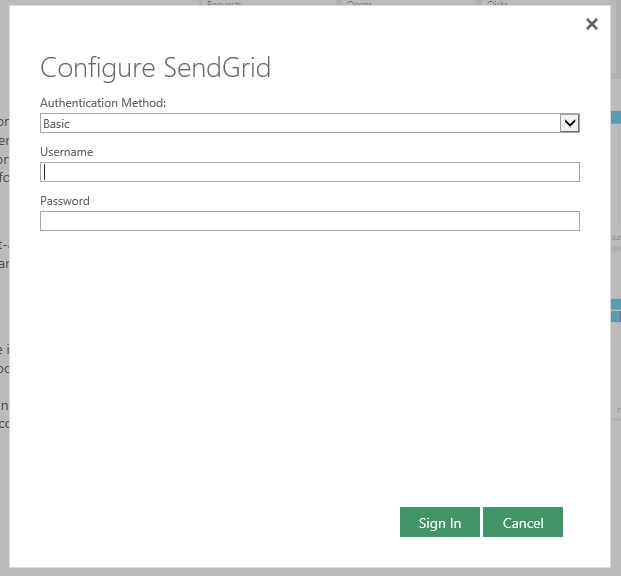 It could take a couple of minutes for your data to be imported into Power BI – but that’s all there is to getting instant insights out of your SendGrid account!